The FT77C-B7079 is TYAN's third generation of the 8 GPU server platform that helped pioneer the GPGPU industry. Featuring two Xeon E5-2600 v3/v4 processors and a quartet of Avago/PLX PEX8747 PCIe chips, the FT77C-B7079 supports 8 GPUs with a 2:1 oversubscription of each x16 root port. This architecture lends itself to high amounts of CPU to GPU bandwidth across pairs of GPU cards and is ideal for embarrassingly parallel workloads such as BLAST searches, brute force cryptography, parallel rendering, large scale facial recognition, numerical weather prediction workloads, and many others. The platform also enables outstanding performance in artificial intelligence, machine learning, and deep neural network applications. TYAN maintains a list of GPU and Xeon Phi coprocessor cards that have passed rigorous validation testing, ensuring reliability during the most intensive of workloads. GPU cards with a TDP of up to 300W have passed validation testing, including Nvidia's Tesla K80 and P100. An array of hot swappable and redundant fans deliver enormous amounts of airflow, allowing the platform to cool even the hottest of accelerator cards. TYAN's FT77C-B7079 has seen adoption and been proven within some of the world's largest datacenters. The same technology relied upon by the top tiers of the world's leading internet service providers is available for production within your enterprise, corporate data center, or research university. To drive a total of 8 GPUs from a Dual Socket Intel Xeon E5-2600 platform, 128 PCIe lanes must be delivered across a total of eight PCIe Gen 3.0 x16 slots. Four Avago/PLX PEX8747 switch chips are deployed to group GPUs into pairs that each share a single x16 uplink. This architecture allows for minor oversubscription of PCIe root ports and provides maximum CPU to GPU bandwidth for such a large number of accelerator cards. Many GPU servers are chained together to form clusters of varying sizes. To support high speed interconnects such as FDR or QDR Infiniband, a PCIe x8 mezzanine card slot is available beneath the system's power supplies. This allows the deployment of a high speed networking card alongside a full compliment of 8 accelerator cards. To provide maximum performance in HPC applications, the FT77C-B7079 supports Xeon E5-2600 v3 and v4 processors with a TDP of up to 160W. Maximum memory is also supported on this platform with a total of 24 DIMM slots. Supporting RDIMM, LRDIMM, and 3DS-LRDIMM, the FT77C-B7079 can support up to 3TB of RAM when fully populated. 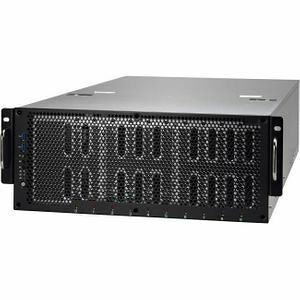 The B7079F77CV10HR-N/X SKUs provides a pair of 1000Base-T networking ports standard, powered by a dual-port Intel i350-BT2 network controller. For applications that require faster base Ethernet, the B7079F77CV10HR-2T-N/X SKUs upgrade the ethernet controller to Intel's 10GBase-T X540-AT2. Both Ethernet controllers feature outstanding driver support in both Windows and Linux operating systems. For clustering applications that require an even faster and lower latency interconnect than 1000Base-T or 10GBase-T, a LAN mezzanine card slot sits beneath the server's power supplies. With a PCIe x8 link, it is capable of link speeds up to 56Gb/s and supports FDR Infiniband.